OMG I better get going on the tooth whitening! 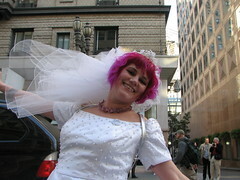 lots of love to my good friend Rusty, who took this photo at Brides of March 2007, and who is currently living her dream of starting her own business! when this first went up on flickr, a few friends thought we hadn't invited them to the wedding. that was not the case! now, we really are getting married, so send your address so we can send you an invitation. thank you Rusty for the great photo! Woo! Congrats! All the best to you two. Congrats from Kit as well. Eeeeeeee!!! So pretty you are! I came across that photo and a few others the other day. So beautiful! I was playing with stripes and your zebra jammies were a great exercise for me! Hope you like it! I got some tooth-whitening gel stuff on Amazon for cheap, and it's working on my wine, tea, smoke-stained choppers.